For the vinaigrette, combine all of the ingredients in a jar with a tight-fitting lid. Shake vigorously. 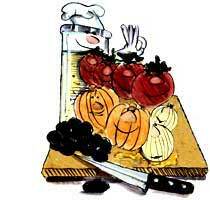 For the salad, slice tomatoes, oranges, and onions into 1/4-inch slices. Arrange slices on a large platter. Sprinkle with chopped olives. Pour vinaigrette over the top of the salad and sprinkle with parsley. Exchanges per serving: 1 starch, 2 fat. Carbohydrate choices: 1.